About Us | The Exit Light Co. The Exit Light Co. provides complete solutions for your emergency lighting needs. While complying with current exit & emergency lighting regulations, you can also save money. (Our exit signs and emergency lights consume less energy than most lighting systems now in use). 6 Reasons to Choose The Exit Light Co. The Exit Light Co. is a premier company in the emergency lighting industry. We continually conduct extensive technical research in the area of exit signs and emergency lighting and have a proven, patented exit sign testing methodology. Our team is composed of experienced professionals that have advised hundreds of companies, and thousands of customers with their lighting needs (see a sampling of our satisfied customers). The Exit Light Co. has partnered with several energy-efficient lighting manufacturers to offer our customers a better price for the same high-quality services and products. You can order exit signs and emergency lighting online (we accept all major credit cards and Paypal accounts), order by fax, or order by phone. Financing is available to qualified customers. We understand that our success depends on the success of the solutions we offer our clients, therefore we are always striving to provide a higher return on investment to your business. 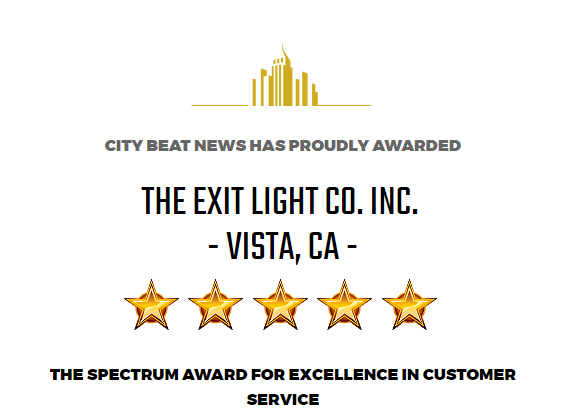 The ultimate goal of The Exit Light Co. is, and will always be customer satisfaction. Our services are guaranteed, and The Exit Light Co. stands behind all our work to assure your company a satisfactory experience. Contact us to request a free evaluation of your building or to learn more about how we can help your business.